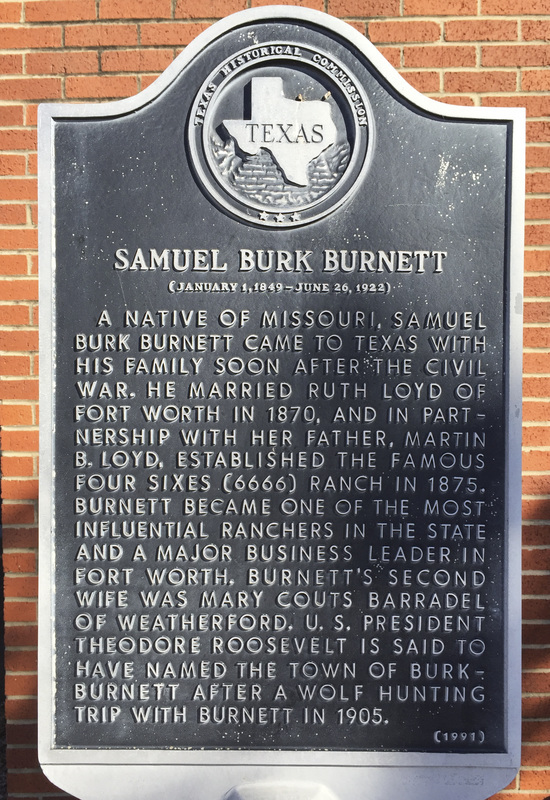 A native of Missouri, Samuel Burk Burnett came to Texas with his family soon after the Civil War. He married Ruth Loyd of Fort Worth in 1870, and in partnership with her father, Martin B. Loyd, established the famous Four Sixes (6666) Ranch in 1875. Burnett became one of the most influential ranchers in the state and a major business leader in Fort Worth. Burnett's second wife was Mary Couts Barradel of Weatherford. U.S. resident Theodore Roosevelt is said to have named the town of Burkburnett after a wolf-hunting trip with Burnett in 1905. Located in front of the post office on 501 County Road, Burkburnett, Texas 76354. GPS 34-degrees 05' 16.4" N -98-degrees 34' 8.3"W.
For information about Samuel Burk Burnett at the Handbook of Texas Online, click the button below.